The Grand Canal linking Dublin to Limerick and the Shannon was extended to Athy in 1791 and the first passenger services commenced in March. The journey to Dublin started at 5 o’clock each morning and took 13 hours. A small hotel was opened at the canal harbour to facilitate early morning travellers. The travel time was later reduced by the introduction of ‘fly boats’ pulled by teams of horses but the fare cost remained rather expensive. The French aristocrat De Latocnaye who travelled from Athy to Dublin in 1796 regarded the passenger boats as ‘very comfortable and indeed like those in Holland but the cost here is nearly double’. Mary Leadbeater, the Quaker writer from Ballitore near Athy, described passengers who undertook the journey to Dublin as ‘half gentry’ and noted that ‘ there was card playing’. The developing commercial trade on the canal in coal, grain and agricultural goods led to the erection of warehouses. 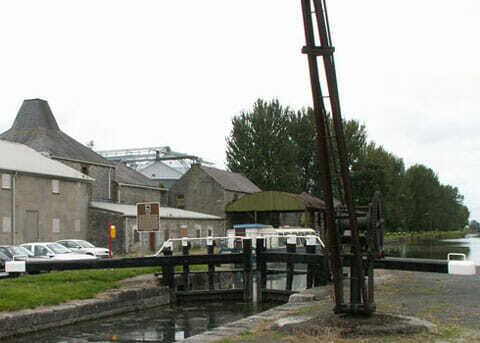 Athy’s link by canal to Dublin and its central position within rich farmlands was a crucial element in the town’s development as a thriving market town during the nineteenth century. Although the canal was used for commercial traffic until the 1950s, its decline began with the opening of the Dublin to Carlow railway line in 1846. Within a few months, it caused the canal passenger services to close.